The Navy’s once-mighty fleet of battleships plied the seas with more than 2,600 sailors, and a few Marines. The leathernecks weren’t just aboard to keep the sailors in line. In true character as riflemen, Marines assigned to battleships’ Marine Detachments manned some the ship’s 10 five-inch guns. Not quite the firepower of the main massive 16-inch gun turrets that gave battleships their famous, and lethal, silhouette, the twin gun mounts were formidable naval guns nonetheless. The Iowa, a 887-foot battleship commissioned in 1943, now sits at Berth 87 in the Los Angeles port of San Pedro, Calif., where in July it began its new life as a floating museum and flagship for the Pacific Battleship Center. The Iowa, hull number BB-61, was decommissioned a final time in 1990, and for most of the years since it has rested with some of the mothballed fleet in San Francisco Bay. Just today, Sept. 21, Marines returned to the Iowa, this time to leave their mark on the ship yet again: An eagle-globe-and-anchor emblem affixed to Mount 55. Then-Vice President George H.W. 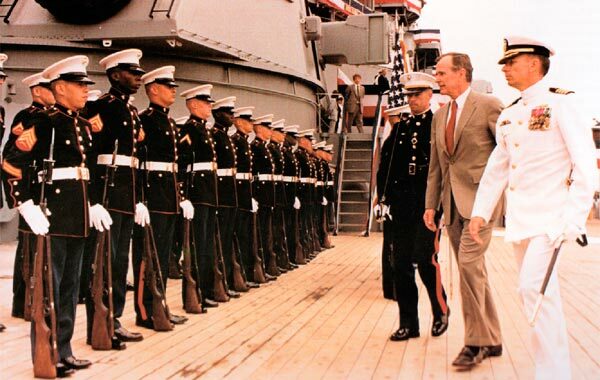 Bush recommissioned the Iowa in 1983, 26 years after the ship was decommissioned for a second time. Here, he reviews Marines on its deck. Bush later met with Iowa sailors and families at a 1989 memorial service for victims in a fatal turret explosion. It’s been a generation since Marines walked the teak weather decks of the mighty Iowa. But now the battleship is getting restored closer to its wartime image, and telling the Iowa’s story is a big part of the Pacific Battleship Center’ s mission to educate the public about Iowa and other battleships throughout the Navy’s history. So the placement of the EGA, the Marine Corps’ official emblem, on the gun mount will also remind museum visitors that Marines, too, played a key role and made significant contributions over the years aboard the warship. The Iowa, the first in a class of 45,000-ton battleships, has had a long and storied history, witnessing the formal end to World War II in Tokyo Bay — the “Battleship of Presidents” had hosted President Franklin D. Roosevelt back in late 1943 — and surviving through two decommissionings and years spent mothballed before the Navy recalled the ship to service in 1984. The Marines who manned the gun mounts on the Navy’s battleships were trained and learned to operate the guns at Sea School at the Marine Corps Recruit Depot in San Diego, Spiese recalled. The museum group, with the help of Navy historians and former crew members, identified one of Iowa’s gun mounts that Marines had manned, and volunteers painted the EGA using a stencil. “You put the emblem on it, and it brings life back to the ship,” said 1st Lt. Garth Langley, a 1st MEB spokesman. Several former Marines who served aboard Iowa joined in the ceremony. “For them, it’s a very nostalgic moment,” he said. God bless the US Marine Corps and the US Navy, the finest partnership ever invented. Those who served make up the body and soul of this union. To those in charge who would send these fine men into harm’s way I say this: be sagacious in your decision making, for these men are not expendable. ‘Marine Detachments manned some the ship’s 10 five-inch guns. Not quite the firepower of the main massive 16-inch gun turrets that gave battleships their famous, and lethal, silhouette, the twin gun mounts were formidable naval guns nonetheless”. Those in the know tell me the 5″ 38cal. 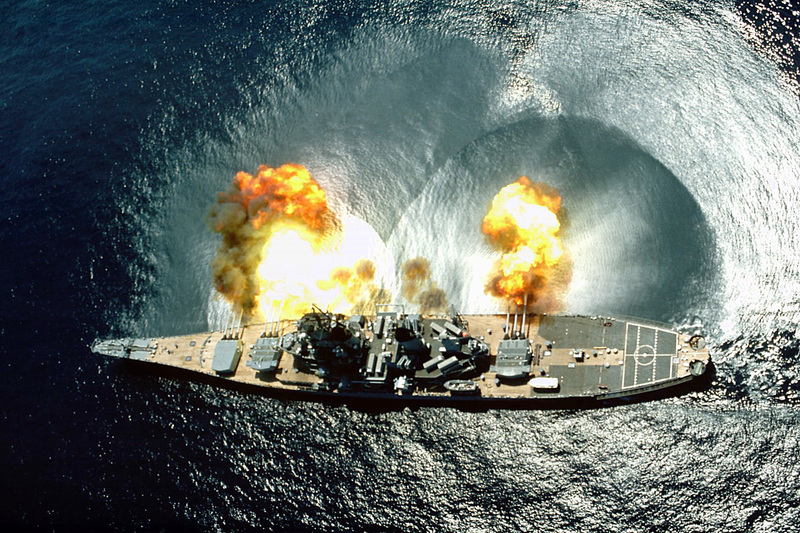 as installed on the Iowa (and many other types) is the finest piece of naval artillery our country has produced, size notwithstanding. It was fast-cycling and extremely effective against aircraft. Small problem with this article, President Roosevelt had already passed away by the time of the signing of the formal surrender, in Tokyo Bay in 1945. The USS Iowa carried FDR to Casablanca enroute to Tehran for his meeting with Churchill and Stalin in 1943. That being said, this was a good article about a great moment for a great warship. One correction to the article. Marines that served as Marine Detachment members went to “Sea School” not “C school”. It was a tough school and taught the Marines the history and customs of serving aboard a naval vessel. Another problem, with the caption under the 2nd photo. George H.W. Bush was not the president in 1984, Ronald Reagan was. There was a short time during Reagan’s first term when Bush was acting president, after the assassination attempt on Reagan, but Reagan served from 1981 to 1989. You are correct, and fixes made to the post. Thank you for the feedback and detailed eyes. Thank you Major General Spiese and Former Marine Marcus Flores for the painting of Mount 55. My wife and I feel honored that you participated in this project. Representing the Marines in any fashion makes us proud. 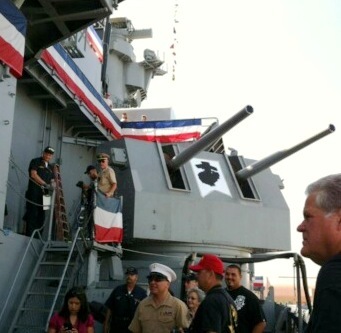 I would like to thank all of the former and presently serving Marines and extend to you an invitation to visit the USS Iowa and see the work that has been completed on Mount 55. Look me up when you are there to say hi. I was a member of the MARDET (May 1987 to May 1989) and actually painted that emblem on there myself. We had a little rivalry going with the Navy. Nothing too bad but we would compete with who had that fastest mount. Mount 55 won many of competition. Well, occasionally, a sailor would sneak up and spray a stenciled “GO NAVY” right in the middle of that emblem. We quickly fixed it. I got pretty good painting it after a while and we added it to one of the checks for Post #9 (our roving Marine Sentry post). I got a photo somewhere of me hanging upside down by a rope painting it one day. I loved that ship and we felt and protected her as if she were our baby! I miss her and would love to come back someday. Hey Kevin Levesque, my ex-husband, Jimmy Solomon, was on the Iowa with you. Nice to “see” you.